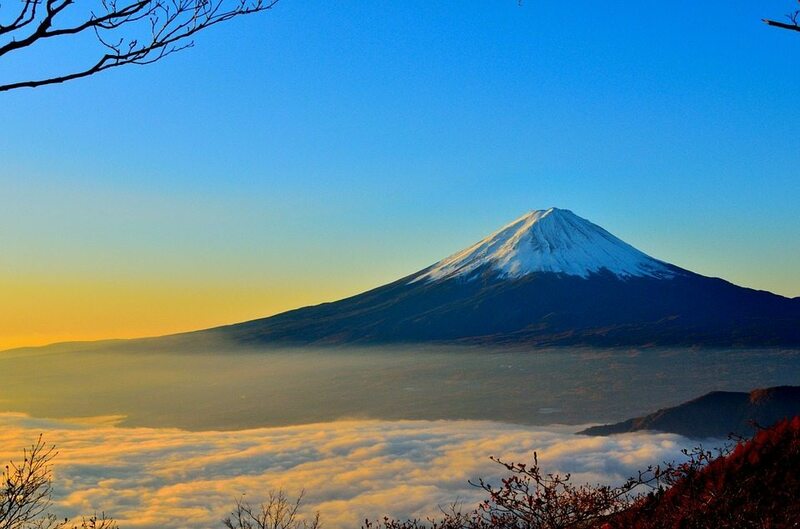 Some say Mount Fuji in Japan is every hiker’s dream, a must-visit for travelers. This behemoth of a landscape stands tall and scared, touching the skies to the southwest of Tokyo, with its summit at 3,776 meters above sea level. It is not surprising, therefore, that many people want to make a trip to Mt. Fuji and locals worship the sacred mountain out of the belief that it is connected to God. Locals believe that whosoever climbs and visits the Murayama Sengen Jinja becomes blessed. Hikers, climbers, and adventurers challenge the peak during the climbing season. According to official figures, more than 300,000 people from across the world climb Mt. Fuji every summer, either for the achievement of setting a record for their lifetime or for the sheer fulfillment of the physical and spiritual self. In the past, trekking in the mountain meant a spiritual fulfillment. That is why many shrines were built in Mount Fuji to indicate the spiritual importance of walking through the different trails. Located beside these shrines at the end of the trails are snowmelt springs of water passing through volcanic lava. It is also recommended that tourists visit the Murayama Sengen Jinja temple, where people in the past were believed to pay homage in order to live a good life. The old temple was constructed a thousand years ago. Another recommended drop-by point for visitors is the Fuji Gen temple situated at the foothill of Mt Fuji. These temples serve as jump-off points to the 5th level of Mt. Fuji. Before trekking in Mt. Fuji, one needs to gather information about the trails, hotels, towns and tour schedules of the place, and the Internet provides pieces of relevant information. When booking hotel rooms around Mt. Fuji, check an establishment’s terms for the use of toilets and bathrooms. Cheap rates mean you will have to share water closets with other guests. Seek information about climbing the mountain – fitness level requirement, training, clothing, sickness, weather forecasts, etc. Mt. Fuji sits in the middle of Japan, with the official designation as the Fuji Hakone Izu National Park. Beyond the 5th station, where hikers begin the 10-hour climb to the summit, and the Aokigahara forest, the area is protected, meaning hikers are not allowed the pilfer the rocks and plants. On any point, almost everybody considers it a privilege already to be standing at the foot of the mountain. But for hikers who can’t resist the temptation to reach the peak of Mt. Fuji, there are many odds that could keep them from trekking on the mountain such as the cost of the trip including airfare, accommodation, transportation, food and clothing and one’s fitness to make the trip. The Kawaguchiko trail is the traditional route and takes 6- 8 hours to complete (walking pace). On your climb you might see the dormant crater, it is a sign that a meteorological station is 30 minutes away from you. Another route is the Gotembaguchi route, which is tougher than Kawaguchiko trail route. It takes about 10 hours to hike the mountain using this route. There are cozy huts to help you on the mountain, selling postcards, gloves, food, raincoats. Aokigahara, also known as the sea of trees as it spreads across the foothills of Mt. Fuji, is covered with lava mud over which trees of various kinds grow with their roots jutting out above the ground. Many tales led to the other name of the forest – suicide forest. According to stories, trekkers found body remains and suicide notes in the forest. Take extra pleasure in what Mt. Fuji has to offer. Visit the Fuji Five Lakes at the northern foot of the mountain, where you can view the beautiful landscape of the lake. Going to the Fifth Station is made easy through a bus ride along a road that ends at the station’s intersection of pavement and soil. Before kicking off the Fifth Station trail, you will find a helpful map at the entrance of the Ochudo Trail, which will guide you through the journey. Although it surrounds the circumference of Mt. Fuji, tourists can never get lost on this trail because it is well-maintained. Finally, when at the Fifth Station, you can find many souvenir shops and toilets. Once you reach Tokyo, there is no trouble taking a bus from Shinjuku. The bus ride takes you to the Fifth Station (as mentioned above), which is the base point of hiking in Mount Fuji. NOte, it takes at least two hours to reach Kawaguchiko – the fifth station. There is also another way to reach Mt Fuji- train. Take JR Tokaido line from Tokyo, then from Kozu change train for Gotemba. Then there are direct buses from Gotemba to the fifth station. And the Gotemba Route is relatively cheaper. The hiking season in Mt. Fuji is strict for two months – July and August. At this time of the year, Tokyo is burning in the heat, but the slopes of Mt Fuji are still mildly cold. Pack your bags wisely to cope with the nightly drop in temperature. All the facilities and routes get closed off during offseason. It is not advisable for even professionals to dare the Mountain after August. Climb the mountain during the late morning, so you catch the sunrise as well as ditch the crowds. And what more? You get to stay at an overnight camp and witness the sunrise too.